Editor's Note: Nicholas James reports YooHav is using the "LinkedIn" template by SocialEngine. 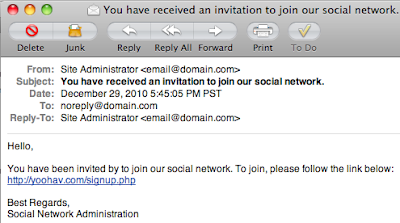 Mass e-mail spam to introduce a social network isn't usually the most advisable way to get press. But after multiple e-mails dripped into my in box today talking of YooHav.com, a new social network to connect with friends, I opted to give the newbie entrepreneur the benefit of the doubt and at least give them a look. 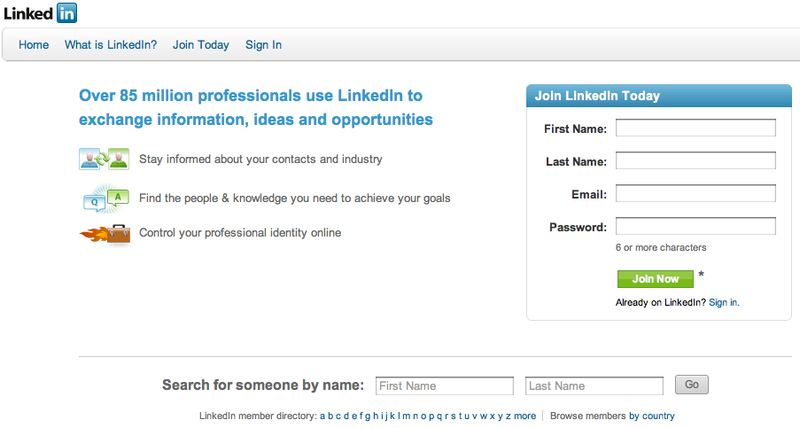 But the first page, asking me to sign up, tells me all I need to know about the service - which obviously and blatantly ripped off LinkedIn's look and feel, including colors, page layout and even the cheap looking clip art you see if you are not logged in. And it gets worse once you start to check out other pages on the site, including dead-end invitations and single-sourced "blog" entries. A total mess. Not interested in signing up to another site and providing yet another place to have my contact details misused, YooHav is going to get a big skip from me. Just as Reeder claimed iPad RSS app copycat MobileRSS had mimicked practically every design attribute last week, LinkedIn will no doubt see the similarities between its own site and that of YooHav. YooHav features a black text logo with its last few letters encapsulated in a blue box with rounded corners. So does LinkedIn. YooHav features soft blue text to explain its service. So does Linkedin. Yoohav features three bullets explaining its goals next to three pieces of clip art. So does LinkedIn. In fact it's the same three... YooHav's sign up form is in a rectangular box with a rounded blue top. So is LinkedIn's. YooHav then prompts for you to Search for someone by name. So does LinkedIn. It's pretty obvious what's going on here. 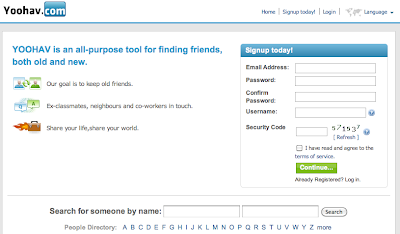 At the very least, YooHav has very clearly ripped off LinkedIn's look and feel in a shortcut to make what they bill as "an all-purpose tool for finding friends". I have no clue what they intend to do with your data if you register, or even if there's something legitimate going on underneath the illegitimate makeup. I invited myself to sign up. 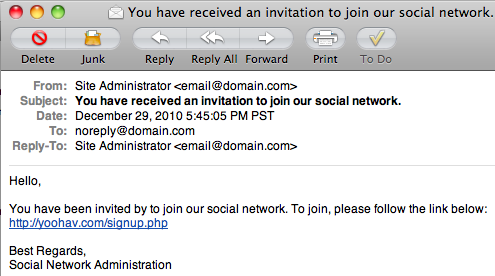 Nice e-mail address and title, YooHav. 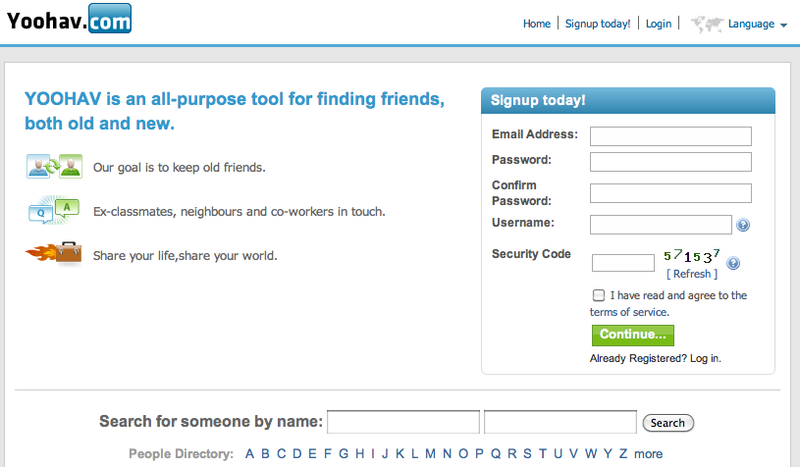 On Twitter, Shel Israel asked if new social networks like Yoohav get people to join by sending e-mail spam. Hopefully not, but this one is so obviously dirty, you'd have to be twelve degrees of naive to fall for it.